The real star of The Shipment is playwright Young Jean Lee’s bold, honest, and hilarious script. As a Korean-American, Lee took on an incredibly uncomfortable task in writing a show about black identity. Originally created in collaboration with an all-black cast, Lee shows that bold choices and a lot of heart can create work that is both poignant and unflinchingly honest. The Shipment takes many forms. The first half is set up like a minstrel show, with a stand-up comic opening, followed by short sketches, dance, and a song. The second half takes a more naturalistic approach. Directors Omari Newton and Kayvon Khoshkam had done a superb job with the variety of styles, providing many avenues for laughter and in keeping audiences surprised. The opening stand-up comedy portion is both hilarious and uncomfortable. Omari Newton, who is both co-director and performer, opens the routine by stating we are “taking black Friday a little too seriously”. He goes on to talk about the difference between white and black people, poking fun in an in-your face, but hilarious way. A flair for comedy, Omari whips through the opening with gut-busting jokes; “You think I enjoy talking about race? All I want to talk about is poop”. Lee works right to the edge of the line. As this section concludes, it takes a turn as the comic gets more and more crass, and the audience stops laughing and begins to shift uncomfortably in their seats. Towards the end Lee flips things once again, as the comic relates a touching moment about his family. The sketch section is dry, playing on black stereotypes, such as Omar who dreams of being a rap star, alongside characters like Drug Dealer Desmond, Drug Dealer Mama, Crackhead John, and a hilarious gay barber named Sashay. 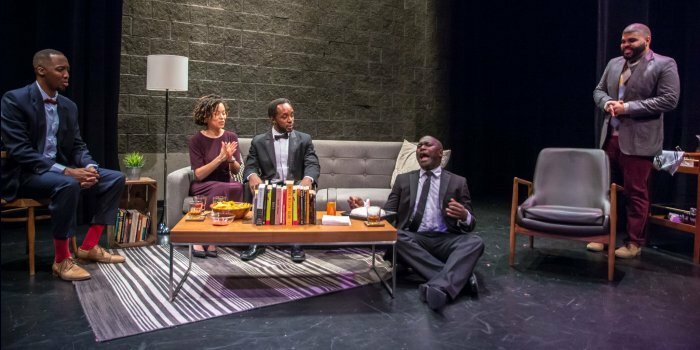 The actors play with a straight-faced, monotone delivery highlighting the ridiculousness of these stereotypes, repeating their gestures in over-dramatic ways. This section does drag on a little long, as the form starts to get old. We are then taken into a section filled with a simple and uncomfortable connection. With the actors standing in a line along the front of the stage, the house lights go up to allow both actors and audience to see each other for the first time. This powerful moment is followed by a beautiful song from Kioma Pyke, “I might disintegrate into thin air if you’d like”. A moment of true catharsis, we hear their voices together, powerful and united. The final section of the show is a one-act play, set in a living room during a 30th birthday party. Chris Francisque steals the show with his nervous portrayal of Omar, who is socially awkward, and with a very specific diet. As the drama slowly unravels, we are left with a ‘surprise’ moment at the end, which perhaps did not come off as planned. SpeakEasy Theatre’s production of The Shipment is powerful, brave, and necessary. In a time when diversity is in a place of transformation, it is highly recommended for anyone who wants to laugh, and reflect on their place in the conversation about race. The Shipment by Young Jean Lee. Directed by Omari Newton and Kayvon Khoshvam. A SpeakEasy Theatre production. On stage at the Vancity Culture Lab (1895 Venables St, Vancouver) until December 2. Visit http://speakeasytheatre.ca for tickets and information.